BioThala a S.A.R.L company was created in 2016 by Intisar MNASRI a young woman graduated from Tunisian high schools in Chemistry. Our company is located in THALA, in west-central of Tunisia, a region known by her Specifity of Prickly pear. Our unit is specialized in the production and processing of organic ingredients, fruits and medicinal plants and the enhancement of Thalois terroir. We have more than 250 certified hectares spread in the region of THALA, in west- central of Tunisia, The altitude of Thala is 1,017 meters (3,337 ft), which makes it the highest and the coldest Zone in the country. Our company supply itself with raw material from The Agricultural Development Groups like “SMSA Zelfen” and others certified by ECOCERT, it is a commitment from us to be a part in promoting local development, urban and rural And now we are in the process of creating a specific Label for the local prickly pear (THALA) where our company is located, and from where our company is sourced. The Secret Flavorsome Portion of our Prickly Pear Seed Oil, and our others products made with passion and commitment toward the well-being and satisfaction of our clients resides in the rich lands of Thala’s terroir and the expertise the of our 137 farmers and technicians including 134 Women from rural areas organized by the regional agricultural development groups with the leadership of the Company’s creator and the processing of Pickly Pear is ensured by rigorous monitoring through a competent team of quality engineers, and production technicians who put all their expertise to guarantee the best quality of our products. 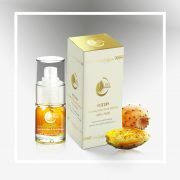 100% Pure cold pressure prickly pear Seed Oil. Organic frozen pulp of prickly pear. Seed flour prickly pear Invigorating prickly pear extract : Jam, vinegar, therapeutic foods and feed livestock. Quality control and Assurance complying with international standardized laboratories and the production process and procedures.